During Combat Valeros activates his boots of speed, using the extra movement to get into a position from which he can take a full attack action in the following round, and maintaining the effects of haste as long as he can continue to benefit from an additional attack each round. When he's unable to make more than one attack, he prefers his longsword and utilizes Vital Strike to increase his damage output. Unless he absolutely must wield a weapon in two hands to gain the additional damage potential, he wields both swords to take advantage of his Two-Weapon Defense feat. Valeros was born on a quiet farm, and grew up dreaming of adventure and exploration. Though this longing only increased as he grew older, so did the responsibilities of agricultural life. Finally, just a month before a marriage of convenience to a local farmer's daughter could lock him into place, Valeros came to the realization that the door to a life of adventure was closing for good. Seized by a desperate need for a larger life than cattle and corn, Valeros packed quietly and left in the middle of the night. In the years since, Valeros has come a long way from the wide-eyed young man who sought only the joy of exploration (and maybe a pretty girl or three). Life on the road is much harder than the bards' tales suggest, and adult Valeros has the scars to prove it. Discovering himself to be a deft hand with a sword, Valeros quickly fell in with the mercenary crowd, learning the dirtier, grittier facts of warfare. After acting as hired muscle for dozens of different employers, Valeros finally realized that it was time to go into business for himself as an adventurer. 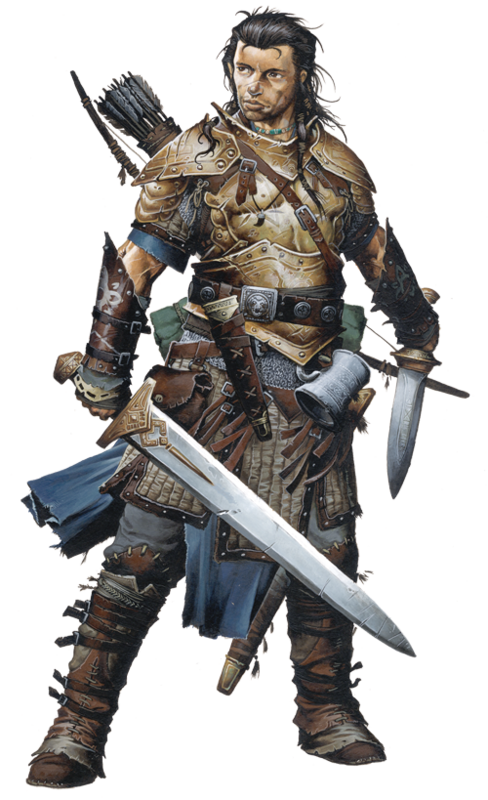 While admittedly not the best at following orders, Valeros is an extremely talented two-blade fighter, easily earning his keep in any group through the tenacity and absolute fearlessness—some might say thoughtlessness—with which he flings himself into combat.